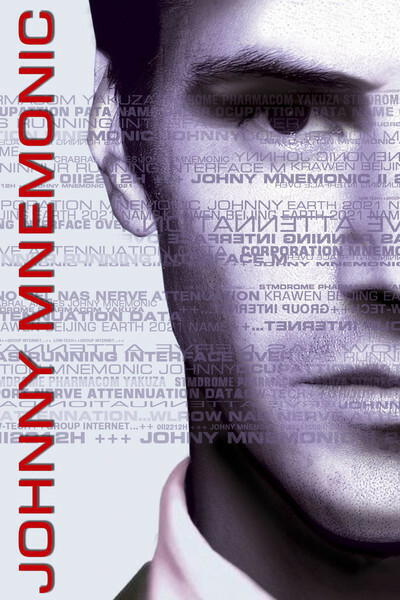 "Johnny Mnemonic" is one of the great goofy gestures of recent cinema, a movie that doesn't deserve one nanosecond of serious analysis but has a kind of idiotic grandeur that makes you almost forgive it. Based on a story by William Gibson, the father of cyberpunk fiction, it has the nerve to pose as a futuristic fable when in fact all of its parts were bought off the shelf at the Used Movie Store. The movie takes place a few decades in the future, when the world is in the grip of a high-tech virus caused indirectly by the high-speed cyber lifestyle. It stars Keanu Reeves as a data courier who has a "wet-wired brain" (no wisecracks, please) into which vast amounts of priceless computer data can be uploaded. Then he travels incognito to his destination, where the data is downloaded. If he doesn't get his brain emptied out fast enough, it melts down and he dies. As a method of data transfer, this stinks. Even today, it would be faster, easier and safer to encrypt the data and send it by modem, and by Johnny Mnemonic's time, the world will be wired with fiber optic cables allowing enormous files to be squirted around the world in seconds. So why would you pump everything into Keanu Reeves' brain and then have a bunch of bad guys from the Yakuza and other crime organizations chase him from China to Newark? Because it's a movie, stupid. And because, in a concept recycled from hundreds of other movies, he wants to make "one more final run" in order to "pay for getting my memory back." (As Johnny explains in dialogue that I think is supposed to be poignant, "I had to dump a chunk of long-term memory - my childhood.") The plot of this movie is breathtakingly derivative. In essence: The hero is entrusted with a valuable cargo, which he must get from A to B without being killed by the bad guys or stepping in anything. There is a pretty girl, evil villains, a weird prophet and of course a violent final shootout in an Abandoned Flame Factory. (You know what an Abandoned Flame Factory is; you've seen them a zillion times in the movies. It's a big clanky warehouse where the hero and the villain stalk each other for an ultimate confrontation, while pointless and sourceless sheets of flame burst out as handy background visuals.) This plot could plug equally well into a Western, a war movie, a samurai film or "Ace Ventura IV." It is not about anything. Or, more to the point, it is the excuse for the special effects. And those are good in this movie - really good. I liked the visuals, for example, when Johnny is getting his multi-gigabyte download (the one that gives him nosebleed). And I especially liked a virtual reality sequence where Johnny sort of goes inside the Internet and handles the visualized programming instructions with his hands, which are wearing remote-control gloves. The problem is, "Johnny Mnemonic" uses the cyber-visuals entirely as atmosphere. Take them away, and the plot could be a 1946 B picture, right down to and including the concocted deadly deadline after a machine in the Newark airport scans him and announces, "Neural seepage! Fatal within 24 hours! Seek medical attention immediately!") The fiction of Gibson is much prized on college campuses, where, I am tempted to say, its fans know more about cyberspace than about fiction. That's why it's puzzling that this movie is so dumb about computers. Where did it get the notion that the best way to get information from Beijing to Newark would be to hand it to a courier and have him travel the distance? Hey, a lot of people went to a lot of trouble to invent computers and modems and satellites just to make trips like that unnecessary. There have also been great advances in the art of cinema since this plot was first recycled - but that's another story.